Peppermint ice cream makes a festive dessert or afternoon treat in a hurry. 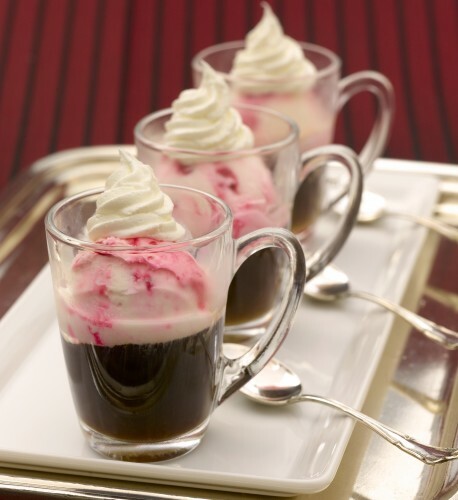 Just brew hot coffee, even instant espresso will do just fine, and top with a scoop of sweet peppermint ice cream. Peppermint ice cream is usually available seasonally, so look for it now and enjoy. And there are lots more recipes here like Holiday Drum Cake, Peppermint Ornaments and Pink Peppermint Soda that I developed for Dreyer’s Ice Cream. Need a cute kids dessert or party treat? 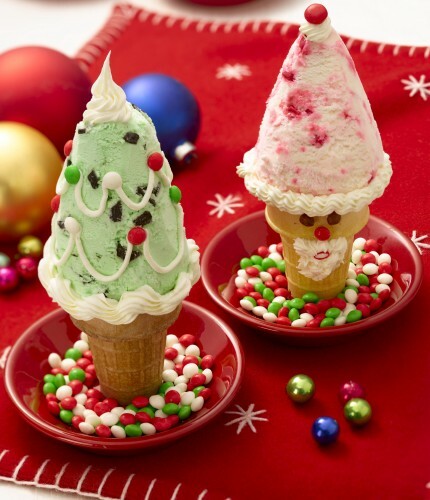 Make these cute cones with pink peppermint or strawberry ice cream for Santas, and mint chocolate chip for Christmas trees. Use cookie sprinkles, frosting and whipped cream for decorating. Scoop and frost ahead then freeze, or set up a make-your-own activity for family and guests. See my tips in the instructions below, and try your own creative decorations. Serve right away of course, as these frosty treats won’t wait! Styled in my kitchen for the idea development. Pour 1/4 cup hot or cool espresso into demitasse cups or aperitif glasses. Add 1 tablespoon Kahlua or Amaretto to each. Add a small scoop (about 1/4 cup) of peppermint ice cream to espressos. Pipe whipped cream on top and serve immediately. For Santa’s face use frosting and decorating tubes to pipe a beard, eyes, and nose on cone. Pipe whipped cream or frosting around cone edge and top of ice cream. 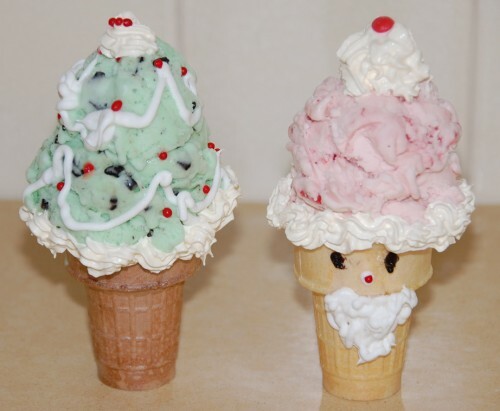 For Christmas tree pipe frosting in a garland around ice cream and place candies for ornaments. Pipe whipped cream or frosting around cone edge and top. Yes, those espressos are really an Affogato. Could have a touch a liquor too, peppermint schnapps perhaps, or?? schnapps!!! Yes, sign me up. Perfect for a cold night. We just got back from a movie, and it’s freezing out there. Literally.